IN A LAND OF GRASS AND GREEN. AS THEY RUN AND PRONK AND PLAY. AND FLEECE AS SOFT AS DOWN. HER THERE AMONG THE FLOCK. THEY OOOH AND AHHH AND SQUEAL. TO ALIGHT IN THE LAND OF GREENE. An explanatory note on the spelling in the last line: For those that don't know, we live in Greene County in Upper East Tennessee, the best part of the Greatest State in the Land of the Free. Our town of Greeneville is named after Revolutionary War hero Nathanael Greene, and is one of ten Greenevilles scattered throughout the US. However Greeneville, Tennessee is the ONLY ONE of all the Greenevilles to keep the "e" at the end of "Greene". We're very proud of our "E". 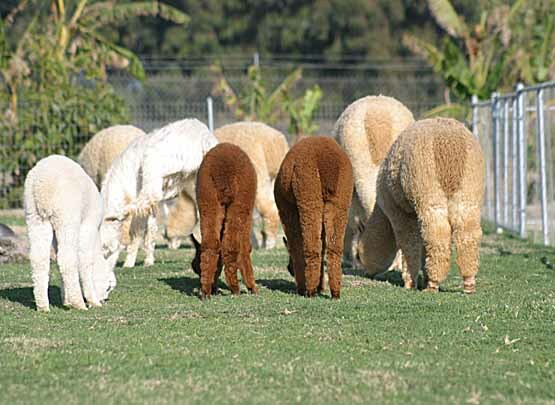 Click on this link to see massive herds of South American alpacas: A YouTube video showing HUGE herds of South American alpacas being raised at high altitudes in the Andes Mountains in their native Peru. Notice the extremely large herds (in the thousands! ), guided by men on horseback, with the alpacas running free on open grasslands. Inspirational in their vast numbers, but far different from the way alpacas are raised here in the U.S. where the average farm raises 10 to 12 alpacas. Herd Pronking at Sunset (with fun music) - Video by Rick Horn of All-American Alpacas in Southern California. Alpacas are not llamas. Here's a semi-silly (but accurate) video on how to tell the difference: Alpaca or Llama? The Llama Song. Really goofy. (Duck if you've heard this before.) Except this version is the NEW Llama Song. Always looking for more info for this page. This is where entertaining, educational, silly, funny or kooky stuff about alpacas will go. Now, Where'd that Gingerbread get off to? Pure Bred and Hand Fed! Click here to return to the top of this page: Alpaca Fun. Click here to return to the Silver Thunder Home Page. Or just click on the Silver Thunder logo in the top left corner of any page on this site to return to the home page.